Bark is working to bring Beavers back to Mt. Hood. We're raising $10,000 on Giving Tuesday to support the work of Bark, including supporting beaver restoration! Give today and your donation will be matched 1:1! If you've already donated to the Bark Winter Campaign, Thank You! Please consider this an update of the great work you are supporting. Beavers are a "keystone species", meaning they play a critical role in creating biodiversity and providing direct benefits to fish, wildlife and people. Beaver dams create wetlands that help decrease the impacts of floods, recharge drinking water aquifers, protect watersheds from drought, decrease erosion, remove toxic pollutants, create habitat for threatened salmon, and much more! Sadly, beavers on this continent have struggled due to population devastation and habitat loss. 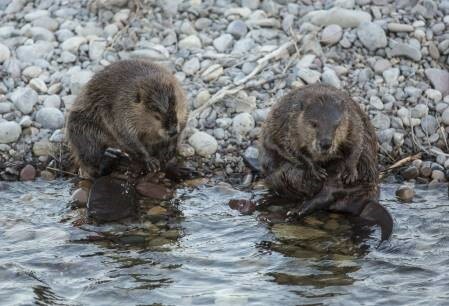 By slaughtering millions of beavers, European trappers and settlers impoverished ecosystems in the Cascade Mountains to such an extent they have not yet recovered. Because beaver-created wetlands store enormous amounts of both water and carbon, their sudden removal from the landscape may have had a substantial effect on changing the global climate. With Mt. Hood National Forest as the source of domestic water for more than one million people in Oregon, and climate change an urgent reality, now is the time to energize beaver recovery in Mt. Hood National Forest. Support Bark's Winter Campaign and help us to tend tomorrow with this and other important Bark work! All individual and business contributions in November and December will be matched 1:1 up to $40,000 by a group of generous donors. A $10 donation becomes $20. A $100 donation $200 and a $1000 donation will grow to $2,000! Over the next year, Bark's field work will provide the Forest Service and Oregon Department of Fish & Wildlife information they need to reinvigorate beaver populations in Mt. Hood National Forest. We're also leveraging our strength of getting people in the woods to actively restore habitat that beavers thrive in, as we did this fall in partnership with a Portland State University class that planted over 300 willows in an old beaver meadow near the Clackamas River. While our current administration continues its path of denial in the face of devastating climate change, beavers give us hope - and a chance to act locally to tend the environment we need to survive. Thank you for your support for the beavers and climate resiliency through our forests. Donate here today and help us raise $10,000 - which will grow to $20,000 for beaver restoration and climate resiliency!